$(4, 1)$ is a point on one end of the diameter of a circle and the tangent through the other end of the diameter has equation $3x- y=1$. Determine the coordinates of the center of circle. What got me about this question was that it didn't give me the circle center and ask me to find the equation of the tangent but instead is asking me to find the center with the tangent equation. I'm so confused as to how to work this out. Is it possible to find the coordinates of the equation? If so, could it be worked out the center by finding the midpoint of the two points? Can someone please tell me the process I need to go through to find the center of the circle, thanks. Refer to the given image. One as you can see, a diameter is always normal to a tangent! .Which gives equation of normal as $x+3y=7$ Now the point of intersection of this normal and tangent is the point $(a,b)$. Which is $(1,2)$ , hence $(a,b)\equiv (1,2)$. Also $(h,k)$ is mid point of $(1,2)$ , $(4,1)$ . Not the answer you're looking for? Browse other questions tagged geometry circles analytic-geometry or ask your own question. 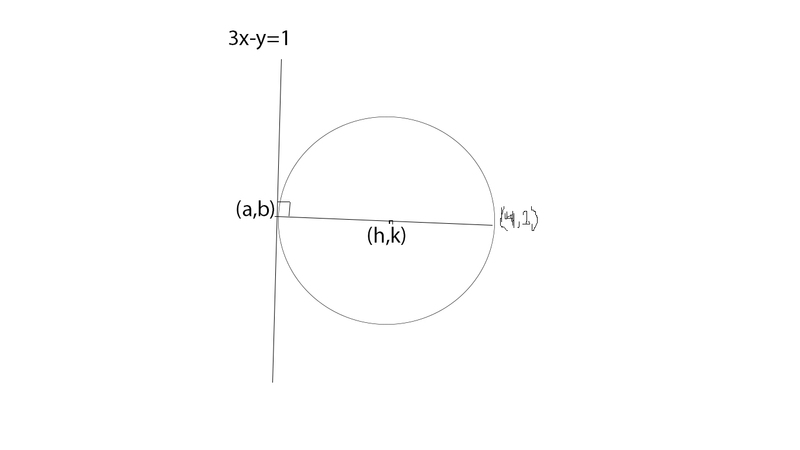 Finding an equation of a circle with a given center and a tangent line. Equation of circle through three given points.